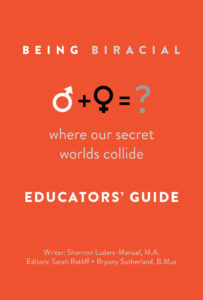 Being Biracial: Educators’ Guide brings the topic to the classroom in a bold examination of race, including considered portraits of current gurus from the multiracial community and a section of questions relating directly to the essays within the original book, with ample space for note-taking. Students are encouraged to re-examine these issues in new and thought-provoking ways, giving all aspects of the subject some vital air time at a key point in their academic development. The Educators’ Guide may be purchased through Amazon, Barnes & Noble and Powell’s. When we wrote and compiled the essays comprising Being Biracial: Where Our Secret Worlds Collide back in 2014-15, we had no concept of the response we would receive. The anthology’s publication was an intensely personal goal we shared with our authors, and we were proud to bring twenty-four stories of the global mixed-race experience to light. Our intention was always to show Biracial and multiracial readers that they weren’t alone; that others shared their internal struggles and celebrations. We never anticipated our readership would encompass academics and scholars, but having received a number of messages from professors across the United States, we were encouraged to put together a companion guide for use in classroom discussion, allowing all aspects of our subject some vital air time. We are deeply grateful to Shannon Luders-Manuel, MA for her bold examination of race, her considered portraits of current figures from the multiracial community and her unflinching investigation of the Being Biracial stories within this book. We hope her words resonate and cause students to re-examine these issues in new and enlightening ways. We thank Alec MacLeod, MFA, Professor of Interdisciplinary Studies at the California Institute of Integral Studies, for his support and academic assistance from the very beginning of this project. His warmth and wisdom have meant a lot to us, and without his guidance, this book would not be the well-rounded educators’ guide you see before you now.